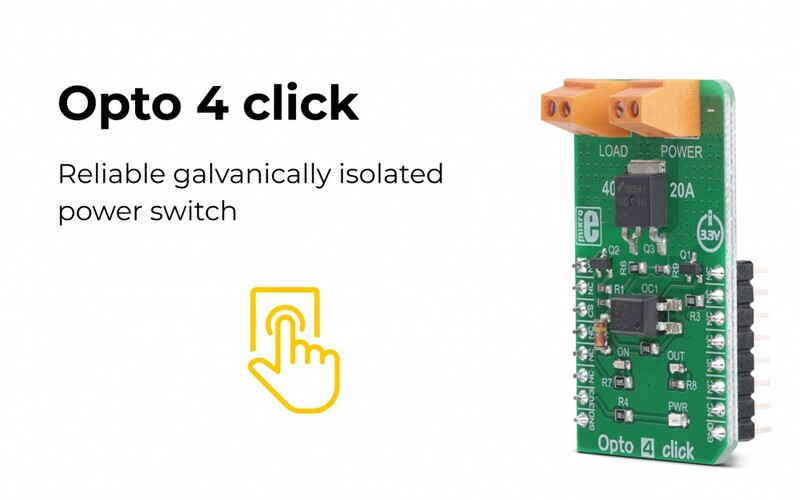 The galvanically isolated power switch, Opto 4 click uses the power MOSFET in combination with the optocoupler. The power MOSFET can withstand significant current due to its low ON resistance, allowing this Click board™ to be used with different kinds of power demanding applications. In addition, the Opto 4 click is equipped with the voltage limiting circuit, which cuts the power off the supply when the voltage of the externally connected power supply drops under approximately 10V. The galvanic isolation of the optocoupler offers protection of the controller circuit, thus preventing any power surges from the controlled circuit. This Click board™ is a perfect solution for the development of a wide range of power demanding applications. You can use it for developing the driving of LED stripes, light bulbs, different types of DC motors, and other similar applications that require an electronically controlled high-current switch. For more information about the Opto 4 click, please visit our website.